I hope everyone had a great holiday! My Christmas was wonderful, my New Year's was uneventful (which I prefer), and the in between was lots of fun time spent visiting family. I know I've been missing for about a week and a half but I thought about you all everyday and the posts I want to share. I made these delicious cookies for you before Christmas and meant to share them but that didn't happen. So, here we are. A little holiday flavor after the holiday is okay too. I know I will make these year round anyway. I'm optimistic about 2013, also because I start each year with an optimistic outlook. This year will be different because I am having a daughter in roughly 10 weeks (it's her decision really of course). My son is super excited about being a big brother (he will be 4 around the time she is born because she's due 6 days after his birthday). Also, I finish school in 6 weeks (only one more class left, Yay!). So, this is going to be a busy year, but so exciting! These Snickersnaps may look a little daunting since it is essentially two cookie doughs, but it's not hard or to time consuming. It's super easy to just mix together the two doughs into tiny balls, roll them in cinnamon-sugar, and bake them. I will say, I sort of love these cookies. The flavor combination is pretty great. I wish I had thought of it myself, but sadly, I didn't. I did change up the recipe a little though in terms of ingredients and the sugar mixture they are rolled in. 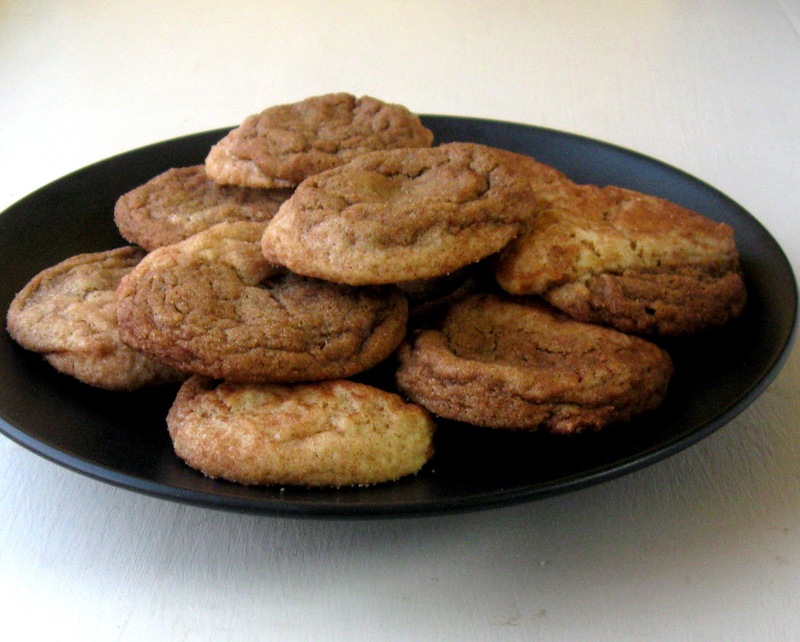 So, if anyone questions why there is 4 tablespoons of vanilla in the snickerdoodle recipe, that's because I read the recipe wrong. That would be a flag for most people, but me? nope. I have written in the recipe that milk could replace up to 3 tablespoons of the vanilla if desired. I obviously have a large bottle of vanilla, which is why I didn't think twice. It did add a lovely vanilla flavor :). I kept the liquid in there because it really adds to the texture so that the dough is about the same texture as the gingersnap dough which works well when rolling the doughs together. Please ask any questions you have and happy baking! 1. In the bowl of a mixer cream together the butter and sugar until fluffy. Add in the egg and vanilla (and milk, if used) and blend until the mixture is smooth and creamy. Add the flour and next three ingredients, blend until the dough is evenly mixed. Set the dough aside. 1. In a mixer bowl, blend together the butter and sugar until fluffy. Mix in the molasses and egg, blending until mixed. Add the flour and next four ingredients, mix until a smooth dough forms. 1. Preheat oven to 350F. Mix together the sugar and cinnamon in a small bowl, set aside. 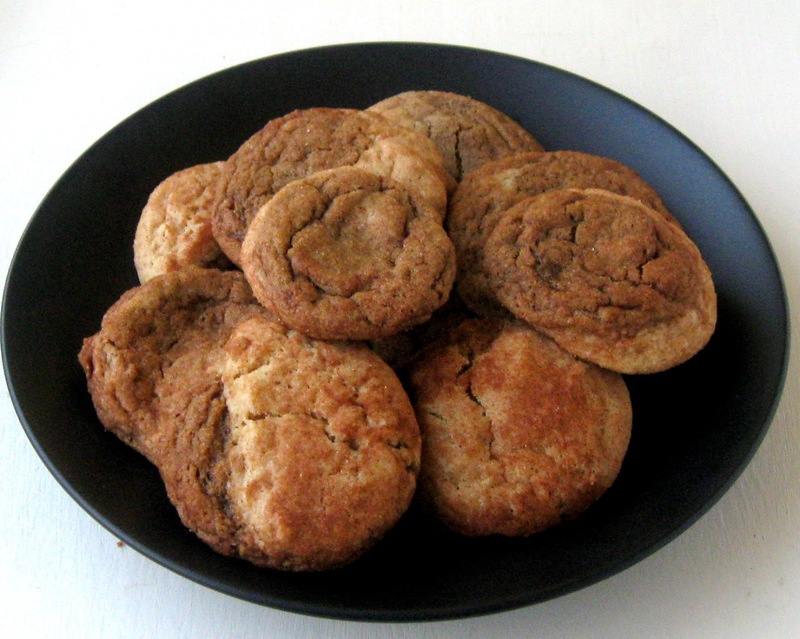 Using a spoon or a small scoop, scoop out about 1 ½ teaspoons of snickerdoodle dough and 1 ½ teaspoons of gingersnap dough (I scooped them both on the same scoop for each blended cookie). Using your hands, roll the doughs into a ball making sure that you can still see both doughs. 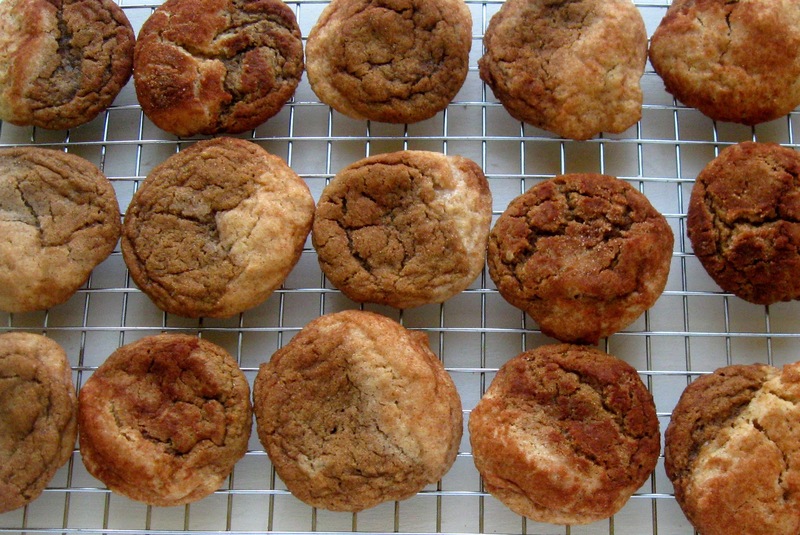 Roll each dough ball in the cinnamon-sugar mixture, and place on a cookie sheet. Bake the cookies for 9-11 minutes, or until just set in the middle and lightly browned around the edges. 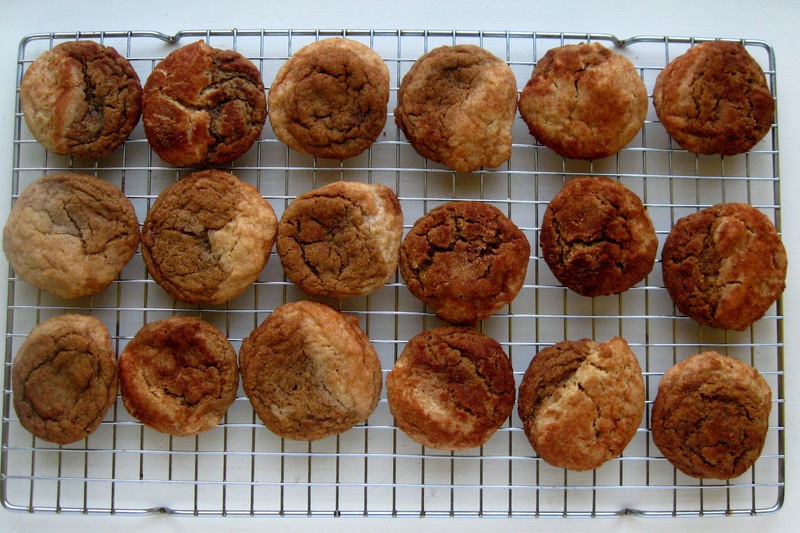 Remove cookies to a cooling rack after about 2 minutes. *I froze all of the dough (after forming the blended balls) on a cookie sheet, then put them unbaked cookie dough balls into a plastic freezer bag. Whenever I want some fresh cookies, I pull out a few and bake then as directed. Wow, you have a busy year ahead - but lots of great stuff! ;-) I love these cookies, and I know my husband will, too. Thanks so much for linking up at What's in Your Kitchen Wednesday! snickersnaps sound like a celebration cookie to me! Thanks for linking on Busy Monday!